Enjoy a very exclusive Grand Tour of Italy with your own Private Jet from North to South of the boot! Enjoy the sophisticated atmosphere of Lake Como and Lake Maggiore, discover the picturesque old university town of Padua, hike along Cinque Terre, try the one of best renowed wine in the world - Brunello di Montalcino, explore Capri by private boat, enjoy a gourmet dinner inside an awesome natural cave in Polignano a Mare, discover the Baroque city of Lecce and the "Trulli" of Alberobello, ride with a jeep on Mt. Etna volcano, discover the "Valle dei Templi” in Agrigento, relax on the white sandy beaches of Sardinia. 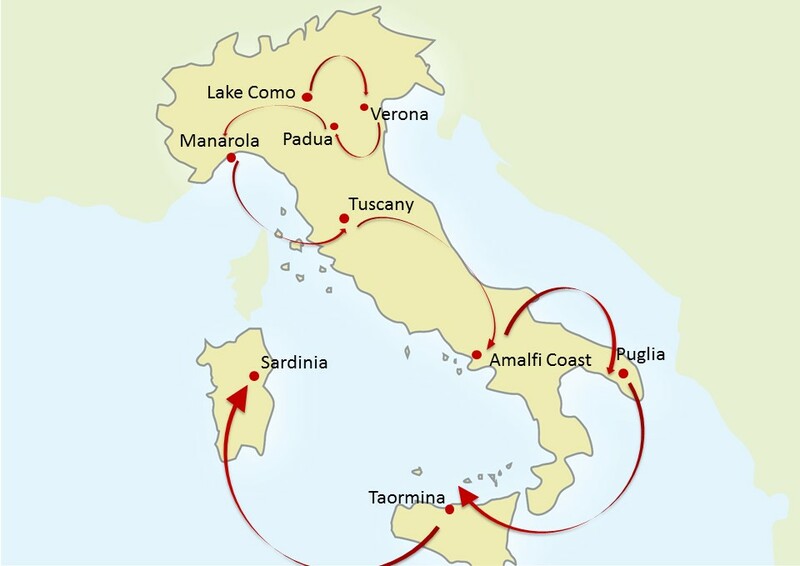 This private Luxury Tour will allow you to discover in a relatively fast way the entire boot of Italy: Lake Como, Lake Maggiore, Verona, Padua, Cinque Terre, Val d'Orcia, Positano and Amalfi Coast, Capri, Puglia Lecce, Alberobello, Sicily, Taormina, Mt.Etna, Agrigento, Sardinia. Explore the best of Northern lakes: Lake Como and Lake Maggiore. Admire the " Scrovegni Chapel" in Padua and discover the picturesque small villages of Cinque Terre, taste the Brunello of Montalcino wine in the Tuscany. Enjoy the magic atmosphere of Amalfi Coast and dive in the blue waters of Capri. Discover Lecce - the Florence of the South - and Alberobello in the heel of Italy - Puglia. Ride with jeep on Mt. Etna Volcano. Explore Agrigento Valle Dei Templi, one of the richest archeological sites in Sicily. Relax and enjoy the white beaches and the crystalline waters of Sardinia. 14 Nights accommodation in exclusive and fascinating 4 sup./5 stars luxury hotels or historical mansions, with full buffet breakfasts: 2 Nights in Bellagio (Lake Como), 2 Nights in Verona, 2 Nights in Manarola (Cinque Terre), 1 Night in Tuscany, 2 Nights in Positano, 2 Nights in Puglia, 2 Nights in Taormina, 1 Night in Sardinia. Full-day private excursion to Lake Maggiore, Padua, Lecce, Alberobello & Locorotondo, Agrigento by van with English speaking driver. Private Boat Tour of Lake Maggiore to visit the Borromean Islands, with private boat and private English speaking guide (total about 5 hrs); entrance tickets to the Villas included. Two hours private boat tour of Lake Como with English speaking captain. Typical full meal in the restaurant of the Isola Comacina and Dinner at ”12 Apostoli” in the Verona (beverages included). Gourmet lunch in at ”Le Calandre” restaurant in Padua. Boat tour of Cinque Terre at Sunset in (2 hrs boat tour with skipper and fishing, drinks on board and tapas included). Full Day hiking excursion on Cinque Terre paths, with private professional local Guide (English speaking) and Full Day Cinque Terre pass (access to the Natural park and unlimited train access). Winery guided visit and Brunello wines tasting in Montalcino. Full day excursion to the Island of Capri by private boat with English speaking captain; snacks & soft drink included (about 8 hrs). Dinner at “Don Alfonso” restaurant in Amalfi Coast. Dinner at “Grotta Palazzese” restaurant in Polignano a Mare. Half-day small group excursion (about 8 hours excursion) with jeep with English speaking driver on Mt. Etna Volcano. Mt. Etna winery visit + Lunch with wines pairing. All private transfers by deluxe van with English speaking driver available for transfers and excursions for the entire Tour (including airports). The tour begins in Milan and ends in Olbia. Enjoy Bellagio with its century-old buildings, stone lanes and picturesque cobbled stairways: the perfect place to soak up the Lake Como's famous panorama. Private Borromean Islands Boat Tour to discover the three main islands of the Lake Maggiore: Isola Bella, the most famous one, with its “Palazzo” and gardens; Isola dei Pescatori with its simple quaint houses lining the cobbled lanes and the fishing boats bobbing along gently in the harbor; Isola Madre, with its beautiful Botanical Garden and all species of pheasants, white peacocks and parrots living freely and the 18th century Palazzo Borromeo, a palace of rare beauty. Full day excursion and Boat Tour of Lake Como by a comfortable private water taxi to get a close view of all beautiful villas built along its banks. Typical full meal in a local restaurant on Isola Comacina. Discover with a private local guide the picturesque old town of Padua with its medieval squares, churches and architecture. You will visit the Scrovegni Chapel, a masterpiece in the history of painting in Italy and Europe in the 14th century, considered the most complete series of frescoes executed by Giotto in his mature age (1303-1305) . Dinner at 12 Apostoli restaurant in the Verona. Lunch at Le Calandre restaurant near Padua. Boat tour of Cinque Terre at Sunset. While cruising the spectacular coast of the Cinque Terre you’ll enjoy an Italian aperitivo. Full day hiking along Cinque Terre: Monterosso al mare, the picturesque marina with its tall, narrow, colorful houses; Corniglia, the only village not directly on sea; Vernazza, the most picturesque of the villages, with small houses, alleyways and lodges; Manarola, the smallest village of the five, walk through the breathtaking “Trail of Love”; Riomaggiore. Tuscan landscape: Val d’Orcia. Enjoy the Tuscan sun and its unique landscape, characterized by gentle cultivated hills, occasionally broken by gullies and by picturesque towns and villages. Winery guided visit and Brunello wines tasting. Start exploring Positano at your own leisure. Enjoy the magic atmosphere with its pink and fuchsia houses, flowering bougainvillea and picturesque square. Stroll amongst the lively streets, visit artisan workshops, amongst the colors and scents of this incredible land. Full day private excursion to Capri: you will visit several of the grottoes and stunning rock formations that dot the coastline, including the famed "Blue Grotto ", the former pleasure pool of the Roman Emperor Tiberius. Dinner at Don Alfonso Restaurant , recognized as one of the best restaurants in Italy. Discover the beauty and curiosity of Polignano a Mare, which attract thousands of visitors every year. It stands overlooking the sea on a steep, rocky cliff cut by a deep gorge. Because of the nature of this cliff a number of caves have been formed, particularly in the sea. Dinner at "Grotta Palazzese" in Polignano a Mare, overlooking the sea the restaurant transports you into the splendour of the cave. Full day excursion to Lecce, Alberobello and Locorotondo. The city of Lecce is named "The Florence of The South". Visit to the historic centre, with wonderful monuments in the local Lecce Baroque style: the Cathedral, amongst the most beautiful in Italy and the Santa Croce Church, a symbolic monument of the Lecce Baroque period. Second stop is Alberobello, famous for its characteristic cone-shaped homes, better known as the ‘Trulli’. Final stopover in Locorotondo,one of the most beautiful towns in Italy, the rectangular and sloping roofs of the houses, which are always spotlessly white, are known as the ‘Cummerse’. Half Day Ride on Mt. Etna Volcano: Mount Fontana (view of Bove Valley), extinct craters of Sartorius Mounts, lava flow from the 2002 eruption.Visit a boutique Etna winery, where the winemaker will be glad to explain the unique characteristics of the vineyards of this area. Delicious Lunch with local food paired with local wines. Guided Tour of “Valle dei Templi” in Agrigento: admire the finest of all ancient Greek sites, with one of the most complete Doric Temples. Enjoy the white sandy beaches of Sardinia in your dreamy seaside resort. From your hotel you will have plenty of opportunity to enjoy Sardinia and explore the most enchanting and fascinating corners of the island: Costa Smeralda, the coast of Gallura, the Maddalena Archipelago, the Strait of Bonifacio, Porto Cervo.